This would be my favorite game in 2010. But that’s the thing- it’s not 2010. The graphics are out of date and there hasn’t been new content in years. It’s still entertaining, but I feel like this game hasn’t aged well like a game like Jet Car stunts has. If I had to choose, I’d go with JCS. But they’re big still enjoyable. I’m going to tell you something I should tell you from a long time ago that make a new mini game at the dinosaur island island make it a dinosaur mini game so please make a mini game please but don’t make dinosaur island episode 49 make dinosaur island episode 50 please even the new mini game should also be episode 50 just make episode 50 about every stuff that you could do in the dinosaur island that includes the new mini game in dinosaur island and episode 49 could be about the werewolf Pygmy please so can you please make every thing I told you please 🦖 🦕. so last time I told you that alien and werewolf Pygmy works when I told you how does the alien work don’t make the alien a Pygmy because at the update song it says they want alien they didn’t say they want alien Pygmy and we don’t need a alien because we already have alien which is the xenu and every body think xenu are not alien but xenu is an alien so don’t make an alien because we already have alien but you can make werewolf Pygmy but don’t. 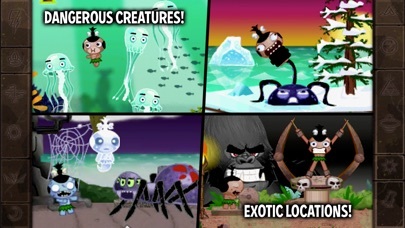 make the werewolf Pygmy come when you press the add make a new update at the graveyard island which is some 5 Pygmy that belongs to the graveyard island and they turn into werewolf when you make it night at the graveyard island so make that as a update please but no alien because we already have alien 👽. so listen I’m going to tell you about the alien and werewolf Pygmy work so 1 make the werewolf Pygmy becomes a werewolf when you make it night and also when the werewolf Pygmy becomes a werewolf at night try to make the werewolf Pygmy bites the sleeping Pygmy 2 make the alien come when when you make it night and you press the plus at night and make the alien Pygmy some light and when the alien light comes to the Pygmy it succeed Pygmy up so make that as an update please 👽. so listen I’m going to tell the new update that you should do 1 try to do an episode 49 and an episode 50 2 one more island 🌴 3 female Pygmy and alien Pygmy and we’re wolf Pygmy but make sure the female Pygmy and alien and the were wolf Pygmy comes you press the add and also give the female Pygmy and alien and were wolf Pygmy names please 👽 🐺. 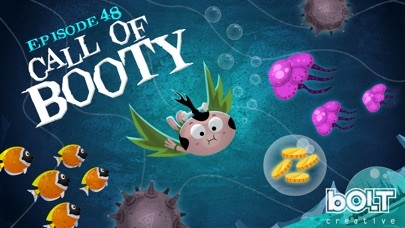 episode 49 is not last episode the last episode that you should do is episode 50 try to make episode 50 the last episode so don’t make an episode 51 episode 50 should finish it please and remember to make one more island not two more island because to more island won’t fit into the map because for now there’s only one spot for one island at the map 🗺. 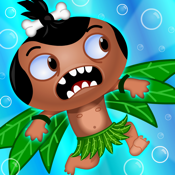 Pocket god may seem boring if you first join the app but there are a bunch awesome and cool things you can other than trying to kill the pygmies (people you are taking care of). My favorite thing was when I got to find all these cool adventures to find the next cool thing you could do. Hope this was helpful! I’d give 5 stars but game has no sound. It’s not my phones issues since sounds play from apps like Spotify or YouTube. Fix this problem and I’ll give the 5 stars it deserves and trust me, it does deserve 5 stars. Used to love this app but it needs to be optimized to utilize the iPhone X’s screen. You need to add girls in it. It’s fun and all but you really need to add girls in it. Still is the same great game from the past. It’s not very compatible with newer devices that have larger screens. 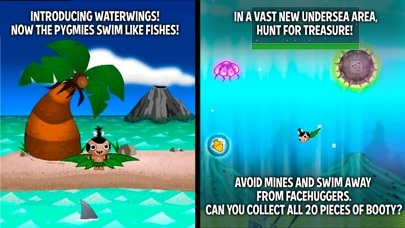 The content is upscaled without a resolution change causing the characters to be distorted and or blurry. I have been playing the game since the first version, and I have had so many great memories with it! If I could give over 5 stars, I would!!!! I used to play this game on the daily years ago in 2012. I then bought it back on my Kindle a couple years ago, but never touched it. Now I have it here, and I love it. I just have one recommendation to maybe add more abilities for the Pygmys. Maybe when a Pygmy becomes a vampire, they can bite other ones to spread it to them. Maybe extend the map a little, or add some more Pygmys. Or even add some cool quests to do. But, besides that, this app is amazing and one of my longest lived. WE ALL NEED AN UPDATE! IT’S 2018 YOU GUYS! ONE MORE NEW EPISODE AT LEAST! AND PLZ CONTINUE UPDATING IT!! IF YOU DON’T UPDATE IT, WE WILL ALL RATE THE GAME ONE STAR AS WELL AS ALL OF THE SPINOFFS!! PLZ UPDATE! WE WANT AN UPDATE NOW! I haven’t seen my grandson... since he got this game.... I blame the mother. Delete this game! Ok so every one has always said, oh it needs updates! But really? Think about the game... Well for me when I think about it I just remember sad things... 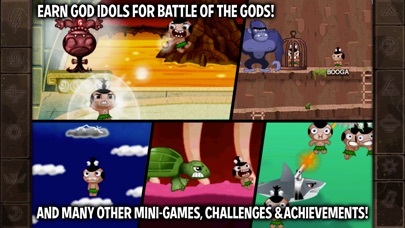 When I was younger I used to get bullied so bad that this game was my only escape... Every day I would come home almost in tears and then lay down... and bring out my crapy old phone and turn on my fav game, pocket god! Seeing the game icon just brought joy to me... The game was so fun and funny! It made me forget all about the bullies... Now I still play time to time and still feel like that happy kid every time I turned on the game! This is why this is my favorite game! Oh my god!!!!!! It's amaze balls!!!! So I was all mwahahahahahahah and they were all TAKE COVER!!!! And this is amazing I mean Zapps Dino's and killing gods!!! wE NEED UPDATES. I deleted the app awhile ago, and decided to redownload it because I was bored. It says I completed all the episodes, but I have any of the gods? They're all locked? Help? When this game originally came out I loved it. The developers updated it regularly, and there was always new, fun things to do. What's bothering me is the fact that I paid for this game, and I am still bombarded with ads. It truly is disgraceful how we as customers pay for a product, and the developers do a poor job maintaining it. This game used to be the best. I remember back in school we would wait every week for the new updates. Whenever a new update came out, my friends and I gathered together and played with all the new features. This game was great, so sad it's over. Re-downloaded it after years of not playing it, and it's cool to see a few new things. People are complaining that there aren't any updates, but they don't know that episode 47 was supposed to be the last one. They did episode 48 just because of popular demand. While I do wish there was a way to have alien pygmy's, werewolves, and female pygmy's, the game is packed with fun things to do. Maybe if the developers come back they can make 2 more episodes to finish it off? Just because 50 episodes is a lot cooler than 48 haha. Personally love the app, just kinda sad the graphics are the same and not high resolution like other apps. But I hope one day Bolt decides to finish up this app for good! And just one recommendation: I think Tom and Charlie should have a more distinct look, like Charlie should be in his tiger form permanently instead of just when slicing a Pygmy. I know the two characters are already somewhat distinct with their facial expressions, but it would still be cool. Just my thoughts! 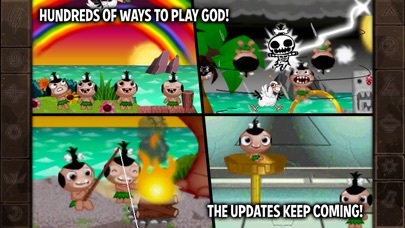 Pocket god is a great game, but it doesn't occupy you for too long. I'd love to see more updates, and such. I feel we just need one last update for the iPhone X full screen support. The app is great! It’s the best AppStore since ever, and I need to know, why this game (that is not free) is not optimized to my iPad, it even have not sound. Please I paid for this and I like this game, and I need a solution, please Apple don’t let down your reputation. 2 years since last update?? The reason I'm not going to rate 5 stars is because they always slide of the islands. Other whys I would rate it five stars. And who is sun? ITS SO AMAZING AND FUN! I played this game many years ago. It was so interesting and fun. So after a few years my life was depending on Pocket Gods. It was such a great choice to make this game. Thank you very much. Umm... who is SUN and why can’t we save her?? I’ve had this game for ages and I have no idea who SUN is! I did ended the apocalypse a couple times over and SUN appeared at the end saying “Hey guys! What’s up?,” and then the alien got her and she screamed, then the alien ate her... First, it says *Go into story mode to see prophecy, okay, so I looked for “Story Mode” and found nothing! So I (once again) need to know WHO THE HECK SUN is! Also, why is her name in all caps? Not anything against the game, it’s just making my curiosity a murderer due to the mystery of this SUN Pygmy. I mean, I love the game, I still play it! Also SUN is a female, why don’t we have female Pygmys? Anyways, I know you guys finished off the game, but please respond to this unveiling these mysteries! Oh, and, somebody said to bring SUN back. Again, CURIOSITY IS KILLING ME!! Was she here before? Who is she? Is she the only female? Will a responder help me here??? Dave and Allan read this now!!! This app is a classic, and has been around for ages. Although it hasnt been updated in months, its still fun and memerable. This game was my child hood,wish they still updated the game,); the last episode (update) was fun. Just purchased and downloaded pocket god on my iPad mini 2, huge mistake. Content is blurry and almost unenjoyable. Use to love this game back in high school and was hoping to pass the love along to my son. Please make it compatible for a bigger display!